I know I’ve said it before, but there are some projects that I think I enjoy photographing even more than knitting (we’re splitting hairs here, but there it is). 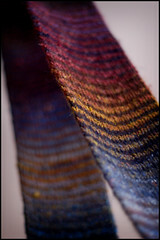 This scarf is surely one of them – and this post is so photo heavy, I doubt the text will be able to hold its own. 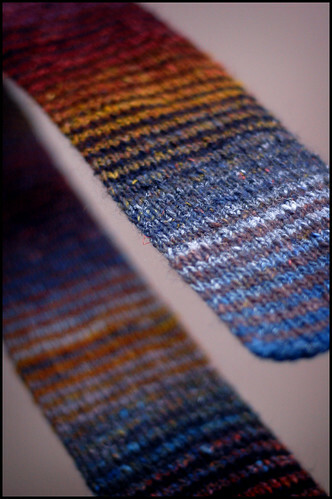 Manually striping Noro is a classic trick done by many a knitter before me – just check out all the beauties over on Flickr. I admit to spending a good amount of time appreciating all the interesting variations on the same theme for quite some time before taking the plunge myself. For full disclosure, this one sent me over the edge. I’ve gotten a lot of e-mails about this scarf so I thought I’d throw out all the details – if it’s too much for you, feel free to gloss over this section and rest your eyes on the hypnotic color changes. Noro is good like that. The scarf is worked over an odd number of stitches in 1×1 ribbing which, in my opinion has two big benefits: the scarf is reversible and behaves very well (no curling) while also plumping up into a thick fabric that will look suspiciously like stockinette if you leave it unblocked. I cast on 39 stitches using US7/4.5mm needles to get a width of about 5.5 inches. On scarves of this nature I prefer to work a slipped stitch edging which adds a nice, polished touch and perfectly hides the working yarn as you carry it up the sides whilst striping to your heart’s content. 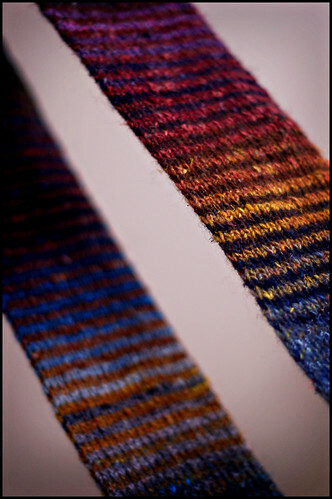 I worked two-row stripes using two different colorways of Silk Garden, slipping (purlwise) the first and last stitch on the second row of every stripe. 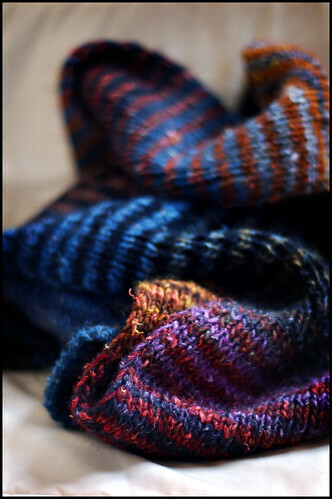 Colorways: I can appreciate all the amazing colors that Noro hits out of the ballpark, but in general wouldn’t wear most of them. They’re pretty bold. 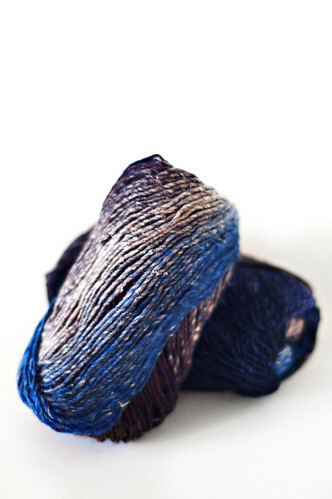 Lucky for me, Noro makes a few colorways that are toned down a bit but retain their luscious, tasteful, saturated quality that the knitter in me is drawn to. Not to mention the texture, which will slay me every time. I used a total of 4 balls of Silk Garden (which will land this scarf in the $40-45 price range if you buy full price retail. 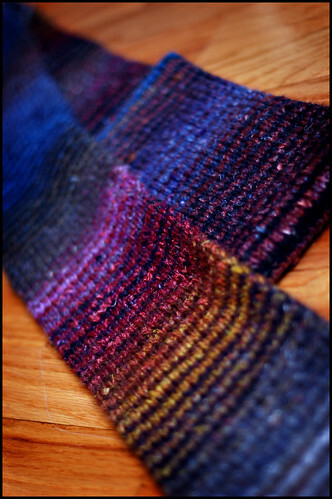 A bit pricey for a scarf but … so … beautiful… ) in three different shades. Two of the four balls of yarn I used were shade #201 which is a nice mix of deep blue-blacks, marine blues, silvery greys with a little purple shock thrown in to keep things interesting. See them pre-knitting here. 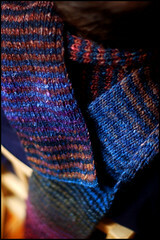 I striped 201 throughout the entire length of the scarf with Silk Garden #234 and #86, two colorways that to me are rather similar. Main colors in both are understated and elegant crimsons, golds and blues, with lots of cool and warm grey tones in between. In their current configuration you can scarcely tell that they’re from two different color families. Pre-knitted cakes of 234 here and 86 here. I’m not sure there’s much else to say about the knitting – it feels a little like cheating working such an easy, mindless process and ending up with such a stunning result. The benefits of a quality fiber (and dye job) have never been more apparent. With spring upon us and summer approaching, I’ll take what few opportunities I can to throw this thing on, but for the next couple of months I’m happy to call it wall-art in my apartment. This is a beautiful scarf ! 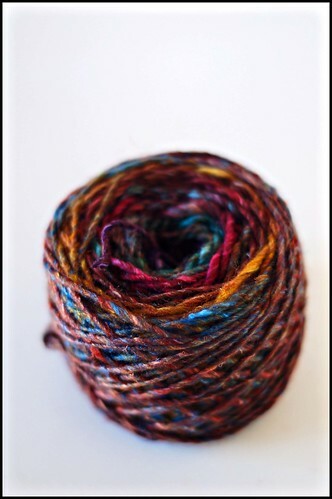 NORO yarn has always had beautiful colors that catch my eye every time I see the yarn. 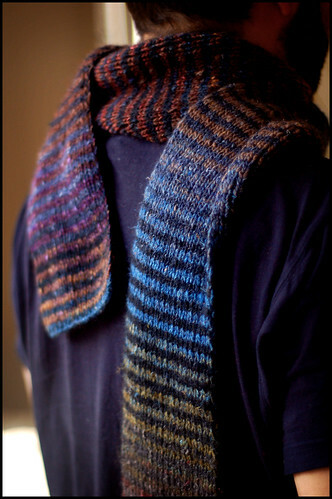 I would love to knit a scarf like this for someone special. Thank you for sharing. Heya i?m for the first time here. I came across this board and I in finding It truly useful & it helped me out a lot. I hope to give one thing again and help others like you aided me. Any ideas of other colorways that might be similar? This scarf may be the most beautiful one I’ve ever seen! Perfect! Beautiful! Can’t wait to start mine!! Yikes! Bought the yarn, read all about it. How to I find the pattern……? This is truly one of the most beautiful scarves I’ve ever seen! I’ve been searching for the colors you used for your scarf. Do you know if they’re still available? I have been struggling to figure a pattern for a simple knit blanket that I can strip piece and strip – but the shear number of ends I would have to weave gave me a headache just considering. This – 1X1 ribbing – is so perfectly uncomplicated. Brilliant! Thank you!! 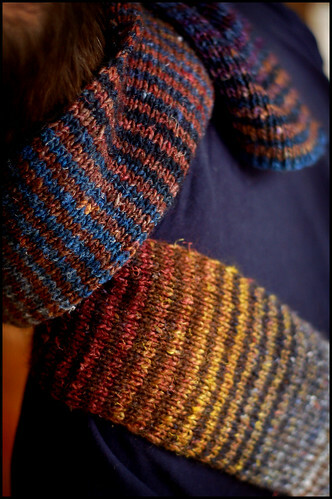 From what I can surmised, Noro changes its colors frequently and you’ll never find the same colors two years in a row. At least this has been the case for me. 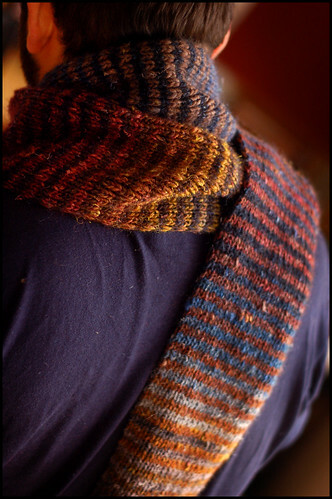 I made one scarf like this and wore it to Vogue Knitting Life. Got more compliments on this than anything else I’ve ever made. About to make another one. However, just a note about Jared – he has such a great eye for color, that his is the most beautiful I’ve ever seen. The year is 2017, and I am still making this scarf for my friends…..
thank you for the pattern…. I love the scarf but don’t understand how it is made: If there are an odd number of stitches and you are doing a 1×1 ribbing, do you start the front side with a knit and the back side with a purl? Thanks! I’ve made this scarf multiple times and am about to start another one. A good pattern never goes out of style. Still love your colorways, too! 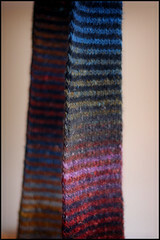 My friend made this scarf and I would love to do it for my husband. inspiration from you Jared and get on with scarves for next year…. Again, Thank You so much!! Anne S.
Thank you for posting this! I’ve made several while wasting time in meetings, in the car, etc. recipients love them! I’ve made this scarf time and time again, always using different color ways and it always turns out perfect! Huge hit with each recipient! Hello, I love this scarf from 2007, but unfortunately the colors you used aren’t available in 2018. I would appreciate it you had some substitutes in mind for #’s 86, 201, and 234. I have read and re-read the blog, somehow I’m missing something. Will you add the written pattern alone please. Really Really Really wish the site made it easier to print the pattern!!!!! Ive just wasted 16 pages of paper and ink- and no pattern!!!! !